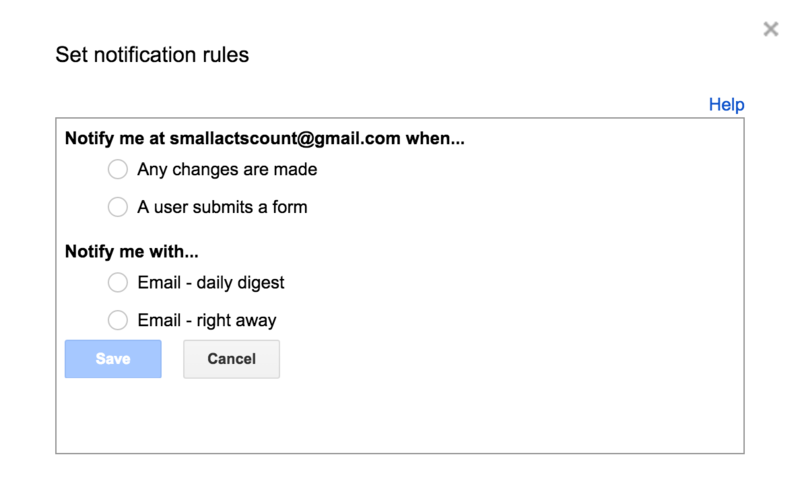 If you want more immediate and automated alerts about changes that your collaborators are making, rather than finding out by reviewing the revision history, you can turn on Google’s notifications for your Tiller Sheet. Select the “Notification Rules” option. In the “Notify me at...” selection you’ll want to choose “Any changes are made” and from the “notify me with” setting you can either get a daily digest or get an email right away. Be aware that if you choose to get an email right away, you’ll get an email every time the feedbot comes along and adds new transactions to your Tiller Sheet, which can be several times per day. The email will indicate who made the change and includes a link, which allows you to quickly access your Tiller Sheet.